Premier champions Man City host Huddersfield on Sunday looking to break records in the Premier League. Pep Guardiola’s side need one more win to break Chelsea’s 2004-05 tally of 95 points and last season’s 30 victories. Victory will also mean they have a great chance of breaking the 100 points barrier from their remaining games. There will also be celebrations for City as they will be awarded the trophy after the conclusion of the game. Huddersfield are in real danger of being relegated this season. David Wagner’s side sit just three points about Southampton and two above Stoke – with City, Chelsea and Arsenal left to play. 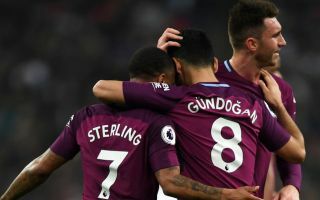 The Terriers were close to drawing against City back in November – however – a late Raheem Sterling goal ensured they won three points. When is Man City vs Huddersfield and what time is kick-off? Manchester City host Huddersfield at Etihad Stadium with kick-off scheduled for 1.30pm on Sunday, May 6. The match will be televised live on Sky Sports Premier League and Sky Sports Main Event, with coverage starting from 12:30pm. Kyle Walker (groin) and Vincent Kompany (illness) should return on Sunday, however, John Stones (groin) is sidelined, according to the Evening Standard. Sergio Aguero (knee) will not be rushed back – meaning Gabriel Jesus should continue to play. As for the Terriers, Tom Ince picked up a hamstring injury against Watford, which meant he was unavailable for their game against Everton. However, they hope he will be fit, according to The Sun. Elias Kachunga, Daniel Williams (both ankle) and Michael Hefele (knee) remain sidelined due to injury.